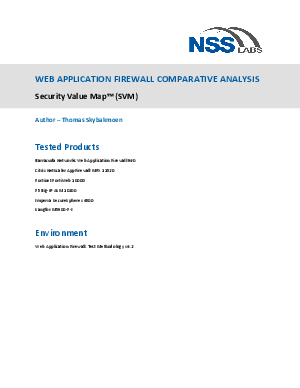 Empirical data from individual Product Analysis Reports (PARs) and Comparative Analysis Reports (CARs) is used to create the unique Security Value Map™ (SVM). The SVM illustrates the relative value of security investment options by mapping security effectiveness and value (TCO per protected-connections per second(CPS) ) of tested product configurations. The SVM provides an aggregated view of the detailed findings from NSS Labs’ group tests.